Robyn Wheeler is the author of Born Mad, a first-hand account of her struggles with moodiness, chronic anger and mild depression. Since publication by Balboa Press in July 2011, Robyn and Born Mad have appeared on numerous television, radio, newspaper, magazine and web outlets including FOX, NBC, The Monitor of Cedar Creek Lake, The Double D’s in the Morning, Dresser after Dark, Your Family Health, The Mary Jones Show and Real Coaching Radio Network. Robyn currently travels nationwide as a public speaker on dysthymic disorder, conquering anger and combating mental stigma. She is dedicated to creating awareness for dysthymic disorder and helping others live an anger-free life. Since writing Born Mad, Robyn has become an outstanding member and coach at Successimo.com, World Wide Who’s Who, the National Associational for Profession Women, the National Association for the Self-Employed and the National Alliance on Mental Illness. Robyn grew up in California, received her bachelor’s degree in animal science in 1988 from California State Polytechnic University in Pomona. From 1996 – 2011, she owned a wildlife education service called The Creature Teacher, LLC where she gave hundreds of presentations to children and adults of all ages on wildlife, pet care and exotic animals. She feels comfortable speaking to small and large groups possesses a strong voice and sense of humor and is always open and honest about living with depression and mood swings. Anger is a natural emotion we all experience. But when anger and hatred take over rational thought, common sense, and love and compassion for others, they will become your own worst enemy , and contribute to more harm. 104 Ways to Starve Your Anger and Feed Your Soul offers you one suggestion a week for two years on how to live an anger-free life. Follow Robyn on her journey from fits of rage as an angry child, blunders and setbacks as an adult in deep denial, to her quest for awareness and enlightenment. Robyn takes you inside her deepest thoughts and fears, as well as her chronic anger and thoughts of suicide. After being diagnosed with a "bad state of mind" called dysthymia, Robyn wrote Born Mad to help others who may be unaware that they might be suffering from a low-grade chronic depression that will make life difficult, ruin relationships, and contribute to a negative and hopeless outlook on life. Born Mad includes symptoms of dysthymia and coping strategies, as well as the story of how Robyn came to believe in God, defeat chronic anger, and become the person she was meant to be. Read about her courage and determination to be happy and how her life has changed after having a "brain transplant." 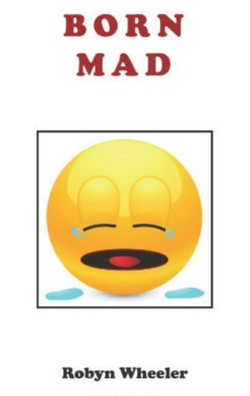 If you or someone you know suffers from constant mood swings, angry thoughts, and extreme worry or anxiety, Born Mad might shed light on the reasons why and how to fight your way through to hope, peace and happiness.